We had an opportunity to purchased several groceries from a Sari Sari Store Bonanza event which was on its 4th year already. It was a jam-packed event but there really were so much savings most especially for store owners. 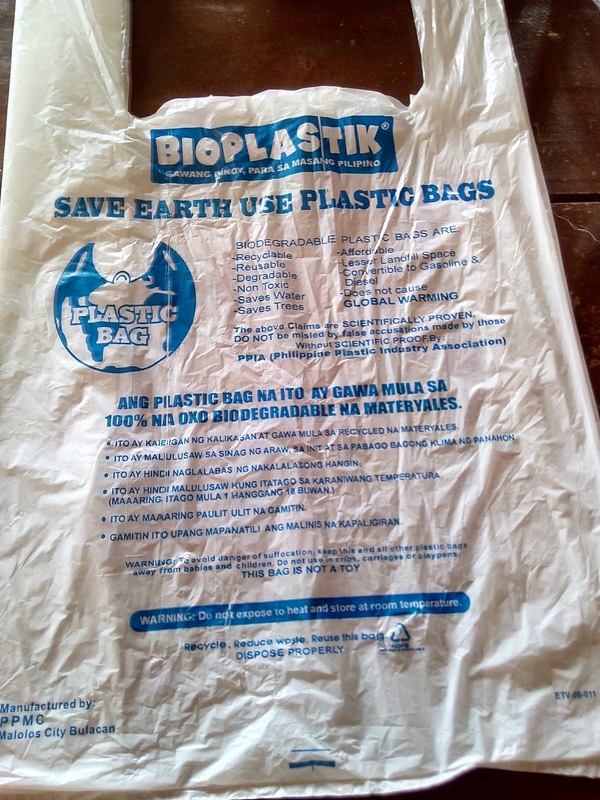 Upon arriving at home, what caught my attention was one of the plastic bag that was used for one of the items we bought. Here are 12 interesting things printed in the photo below. Photo taken using my own Starmobile Turbo phone. The above Claims are SCIENTIFICALLY PROVEN. DO NOT be misled by false accusations made by those without SCIENTIFIC PROOF. I am not against the use of paper bags especially for groceries but plastic bags are really practical especially for wet market items. Regarding saving earth, upon analyzing it thoroughly, the use of plastics really saves a lot of trees from being cut in contrast to the number of fallen trees used for paper production. Also, at this age of information technology, we should be promoting "PAPERLESS" system especially for our documents. This is off-topic already and we do still need papers among other things which need not be listed here. We cannot really stop the production of plastics as well as the production of papers. For environmental purposes, it is really just a matter of proper disposal of garbage which includes segregation. Waste management is a big issue and plastics are just a fraction of it because wastes also includes papers, steels, human wastes among other things. HELP SAVE EARTH BY PROMOTING CORRECT WASTE MANAGEMENT. And yes, at home, we do practice segregation of plastics, papers, bottles, cans and residuals. It is our way of contributing in helping our Mother Earth.